The Macalope Weekly: Apple Stories Gone Wild! 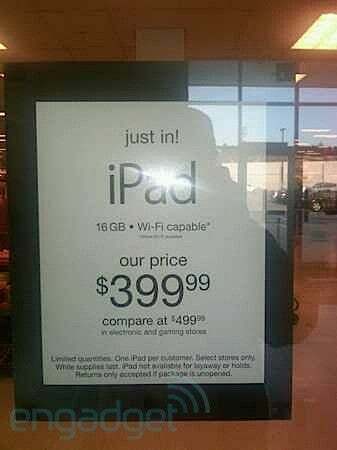 Discount retailer T.J. Maxx reportedly has 16GB WiFi iPads in stock--and they're giving them away for $399. Engadget reports that a tipster named Aaron discovered Apple's prized tablet selling for $100 off the asking price at a T.J. Maxx in Vernon, New York. Engadget says that it called some other T.J. Maxx's across the country and found a few stores with iPads in stock--Ohio and New Jersey included--while other outlets reported no such deal. At least one store said they'd be holding back their stock for Black Friday, so you don't necessarily have to rush out to your local T.J. Maxx right this second. Quantities are, obviously, limited (one of the pictures the tipster sent in shows just seven iPads lined up behind the register), but otherwise it looks like the real deal. The iPad is sure to be a hot gift this year--after all, it is the fastest-selling electronic device, ever--and while T.J. Maxx's deal sounds pretty good, it may not be better than Apple's Black Friday deal (Apple traditionally offers between 25 and 30 percent off of Macs and iPods, although we have no idea where the iPad stands).